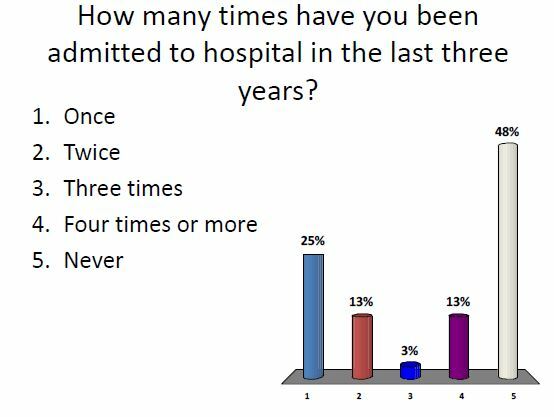 The good news is that half the group have not been in hospital in the last 3 years. The not so good news is the other half have been admitted to hospital and a quarter have been admitted more than once. In itself this represents significant use of hospital services but given the relatively young and mobile profile within this group, it’s probably a significant understatement of the demands placed on the health service by the majority of older people in Coventry. all the blogs with reference to ‘CAFE HEALTH and ‘Checks’, as one suspects tends to included the 72+’s but under 83 years of age, population, in any resonably sized UK Town/city. The problem is relate this to expectations, and a thought process, of sorts! The captured audience appear to enjoy good health, and naturally wish to spend their days to the ful being fully, mentally and physically active. The ‘RUB’ comes when they become vunerable, either to ailment/sickness, or infirmaty, and require help and assistance of sorts to live as normal a life as possible. Here one has to engage thought, and some form of thought process, before one reaches stages of dependancy on other people? Does one develope a cose knitted community of friends, of seek out thorough the internet people and agengencies such as ‘HELP THE AGED’ The Salvation Army, or other Christain bodies, or community bodies that can help. If one thinks carefully of ones options then maybe a careful thought or two of what to do? and when to downsize, if one needs to downsize/move, does one go into warden control/ social old aged housing (OAP Social Housing), retirement village, or Hanover Housing or Stone Macathy housing, what are the choices, and waht is the wiser move. Sometimes it is for security, dependancy and help, and the biggest unknown factor is breavement, and to have a circle of friends who knew you and your partner when you where ‘a happy go lucky couple’??? One has to face these demons and then what is the choice or what are the choices? Talk to your partner spouse, and family, and see if you understand what is in front of you at 70+, and the choices that one may have, or at least influance, for the benifit of YOU and your partner. The years get older with the body and mind, but the days and time like the young get shorter.